While it would seem that the first couple of weeks following the New Year should be filled with productivity, I always find my self struggling to pick up where I left off before the holidays. Late mornings and lazy days have been commonplace around here since the beginning of 2018. 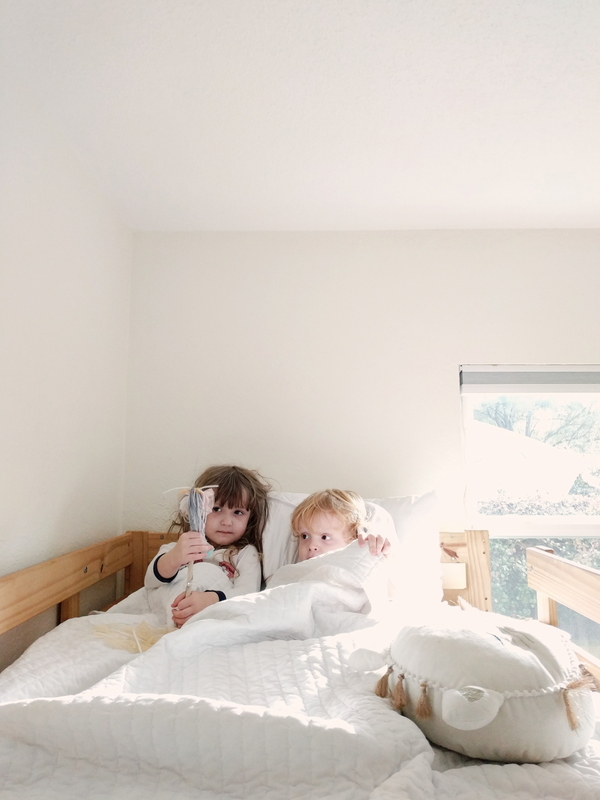 One of those lazy mornings, I found Isabelle and Philip snuggled together on their big sister’s bunk bed where they stayed and played for a solid hour. Lazy mornings are actually pretty enjoyable, although I don’t mind productive ones either. I hoped our kitchen would be put back together by Christmas but we had a few weeks where progress was stalled. Yesterday our plaster contractor was able to come out, after rescheduling twice, and should be done with the work by today. 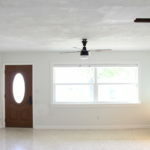 We’re smooth coating over the popcorn-like ceiling and matching the texture on the once-wallpapered kitchen walls. After all the messy parts are finished, we’ll be refinishing our terrazzo floors (a three day process), then we will be able to begin rebuilding the kitchen. Despite the delay in progress, I’m so thankful I am able to walk around this year. Last year I broke my foot and couldn’t walk for nearly three months. So although progress may be slow, at least progress is happening and I am able put work towards that progress. Speaking of progress, our baby should be arriving in early March and there is still so much to be done, including deciding on a name for him. I recently came across Heriot as a German variation of Henry and love it, but most people associate it with the feminine alternative Harriet. My other top pick isn’t a popular choice either. If there’s anything we’ve settled on, it’s that we’ll most likely be waiting until we spend some time with him before choosing a name for our baby boy. This means we may be bringing him home from the birth center nameless, since my birth center sends mothers home four hours after giving birth, so long as there are no complications. This will be our first time waiting to decide on a name and it’s a crazy notion for me to think about. I look forward to sharing more updates on everything as they happen. I’ll be sharing little tidbits on my Instagram stories, so be sure to follow @turningithome.